As we approach the end of another school year, I wanted to share with you all one of my favorite ways to wrap up: awarding Spanish language superlative certificates to each of my students. I'm not talking grammar here! The superlatives I'm referring to are silly awards for The Best Hair, The Most Artistic, The Class Clown, etc. 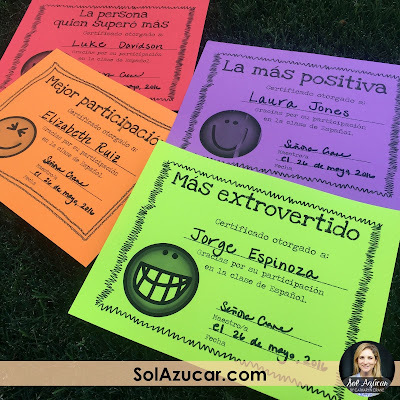 My high school would award these to seniors every year, so it was a fun idea to adapt it for my individual classes, translating the idea to Spanish. On one of the last days of class, I spend about 20 minutes calling out all the awards and distributing an accompanying certificate to each student. I often tell a little story, building up who the award winner may be and why. Then I call their name, they come up to accept their award, and the class applauds. Best part is this is done in 100% target language! In Powerpoint, I made a certificate template, like these (below). I made male and female versions of most of my awards and tried to use cognates when possible. You could also make these in word and add a sticker instead of the clipart once you print. I have made and used a couple of different award styles with my students and sell them in my Teachers Pay Teachers store if you're interested. I pull out my seating chart and go through assigning an award to each student. This is actually a fun reflective activity for me. If there's a student who doesn't quite fit the awards I've already made, I try to come up with a new one especially for them. This option is great for remembering inside jokes among your class as well. 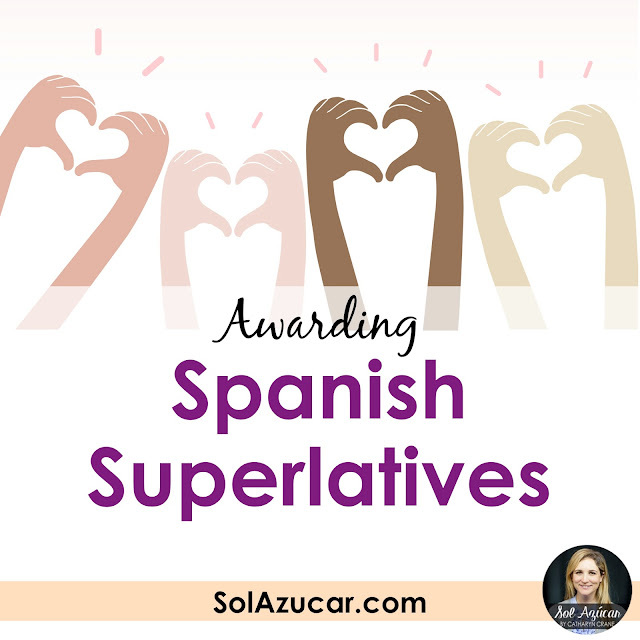 Make a list of all the award categories, print it out, make a copy for each student, and each student writes in student award nominees for each of the categories. This is a nice way for them to get in a little target language reading in the process. I print my awards on brightly colored card stock, but you could buy certificate paper as well. As I've mentioned before, investing a few bucks in high quality supplies is such a simple way to "up" the importance or value of any activity in students' minds. Using nice paper, adding stickers or seals to the awards, using fancy writing, and your actual signature shows students you love them. I reserve about 20 minutes to hand out the awards, and pick one of the last days of school. Might be a perfect way to spend one of those shortened periods, senior ditch day, or a gap day where you don't want to pursue new content. I begin the award presentation by talking a little about the person about to receive the given award, giving hints as to who it might be. Then I announce the award, show it to the class, and say the winner's name. They all applaud, and that person comes up to receive their certificate. Simple as that! Have you given out student awards in Spanish class? What advice can you share? Interested to hear all your great ideas, if you'll comment below! 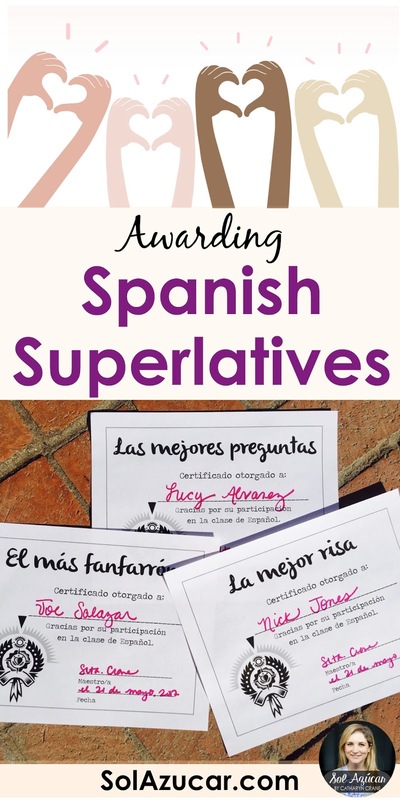 And if you're short on time or ideas, you might get some inspiration by checking out my Spanish Superlative awards, for sale on TpT. Thank you! I am having a hard time thinking of Spanish award titles. Love this, but have no artistic talents myself so I will definitely be downloading your set from TPT. Gracias!